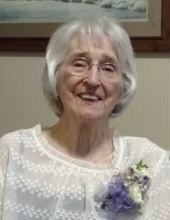 DuPilka, Lorraine - Age 91, of Linden, left this earth September 10, 2018. Lorraine was born April 5, 1927, the daughter of Ottis and Anna (Grambuski) Timmons. She was a resident of Flint, Michigan until moving to Linden in February 2014. Lorraine was a 1946 graduate of Flint Northern High School, she retired from General Motors in 1978 with 31 years of service. Surviving are: nieces, Cynthia Woods, Beth Howarth and Joann (Dale) McKim; great nieces, Miranda Woods Robinson, Kelly Howarth, Shae McKim; great-nephews, Jacob Howarth and Cody McKim; honorary sister, Marjorie Miller. She was preceded in death by her parents; sister, Juanita Creamer; husband of 20 years, Frank DuPilka; long time friend, Duane Lusher. As per her wishes, cremation has taken place and no service is planned. Those desiring may make a contribution to the charity of their choice. Condolences may be posted on the obituaries page of www.sharpfuneralhomes.com. To send flowers or a remembrance gift to the family of Lorraine DuPilka, please visit our Tribute Store. "Email Address" would like to share the life celebration of Lorraine DuPilka. Click on the "link" to go to share a favorite memory or leave a condolence message for the family.